Special thanks for donating to our prize pool. Walk More in Four, a walking and biking challenge for students K-8 across the state, begins April 8 and runs through May 3. Participating students will be entered to win bikes, scooters, helmets and more from our prize pool worth $3,000. The more students walk or bike to school, the greater their chance of winning. Walk or bike to school. 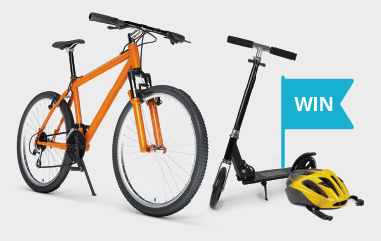 Each time you walk or bike to school you’ll be entered for an additional chance to win a sweet prize. Download the chart to keep track of the days you walk or bike to school. Submit your progress chart online as early as May 3 and no later than May 8. Winners will be notified by phone or email. Winners will also be announced on the Safe Routes Utah Facebook page and website. Prizes will be distributed May 13-17. SUBMISSIONS ARE ONLY ACCEPTED ONLINE. PLEASE USE THE FORM PROVIDED BELOW. *Students are only eligible to win one prize. 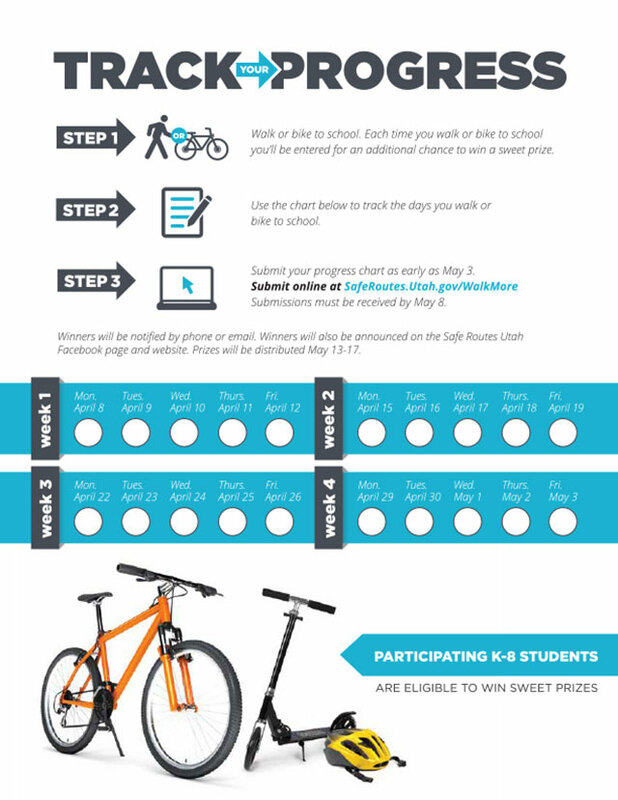 After the challenge is complete, use this form to submit the total days walked or biked to school. Only one, comprehensive report that includes participation for all four weeks should be submitted. The submission window is May 3-8. Reports must be received by May 8. To be eligible for prizes, remind participants to send in progress reports by May 8. Online submission only. Winners will be contacted by phone or email. Prizes will be distributed the week of May 13. Safe Routes Utah will be launching a year-round program to incentivize students to walk or bike to school throughout the entire school year. Keep a lookout for more information.